I finished my temp job and can now return to my usual garbage routine. I plan on going on a eBay listing spree soon to prepare for what I expect will be a busy and profitable holiday season. There’s just one little problem: I can’t find my camera. I probably left it somewhere dumb as I tend to do, though I worry that someone might have taken it if I left it somewhere especially stupid. I hope it turns up because it’s a great camera that’s worth around 200$. I have a backup but it requires a proprietary data cable and uses the memory stick (instead of the usual SD Card), making it useless until I can track down a cable or adapter. (If I were Prime Minister I’d ban proprietary cables… but that’s a rant for anther day!). Regardless, even if I track down the necessary parts it can take time to get used to a new camera. If I can’t find my old faithful I have hours of frustration and mediocre photos ahead of me. On the plus side I managed to have a couple yard sales this week. 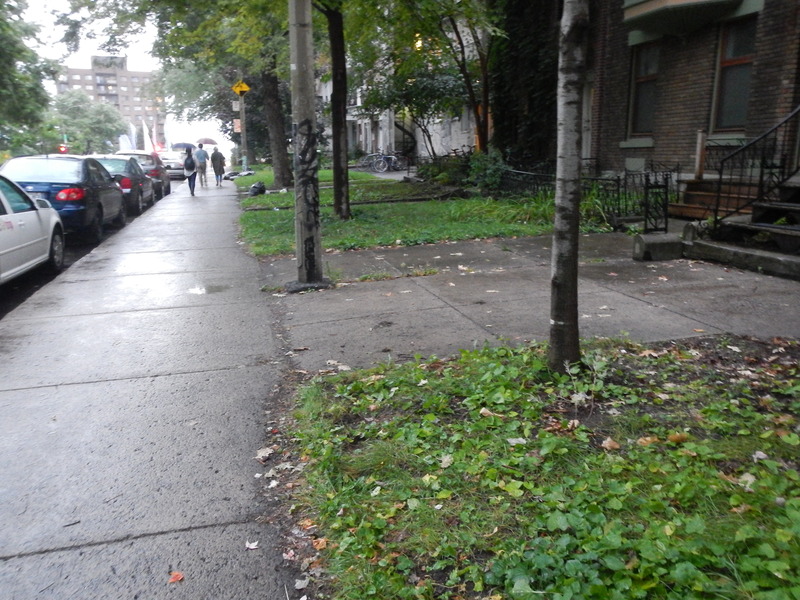 I found a good spot close to Parc Jeanne-Mance where sales seems to go off without a hitch. I’ve had issues (and gotten warnings) about sales at spots closer to home so I’m thankful I was able to pull something together before the end of the summer. Overall I made a few hundred bucks and opened up a lot more space to store new stuff. Now, lets get to the finds! 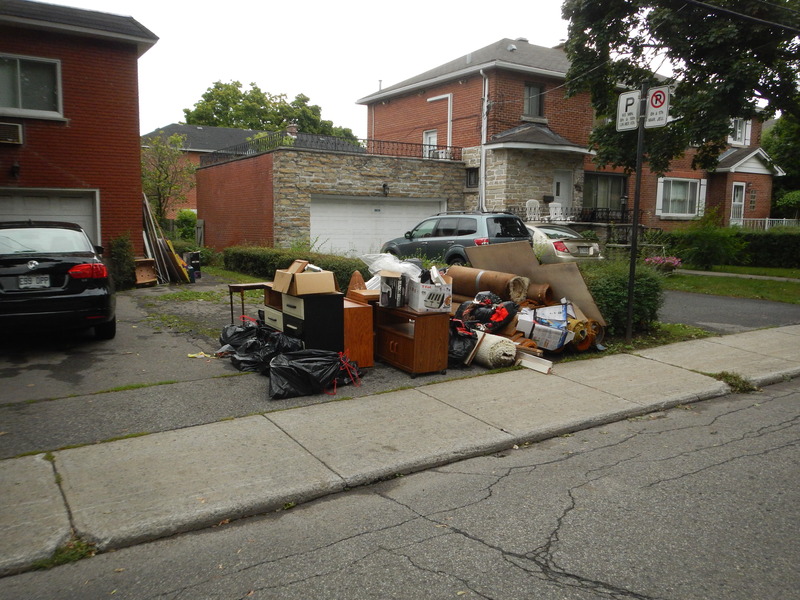 I came across this pile on August 31 in Outremont. My guess is that a couple of university kids moved from their apartment and left their extra junk. Inside a black bag was a working Blackberry Bold 9780. 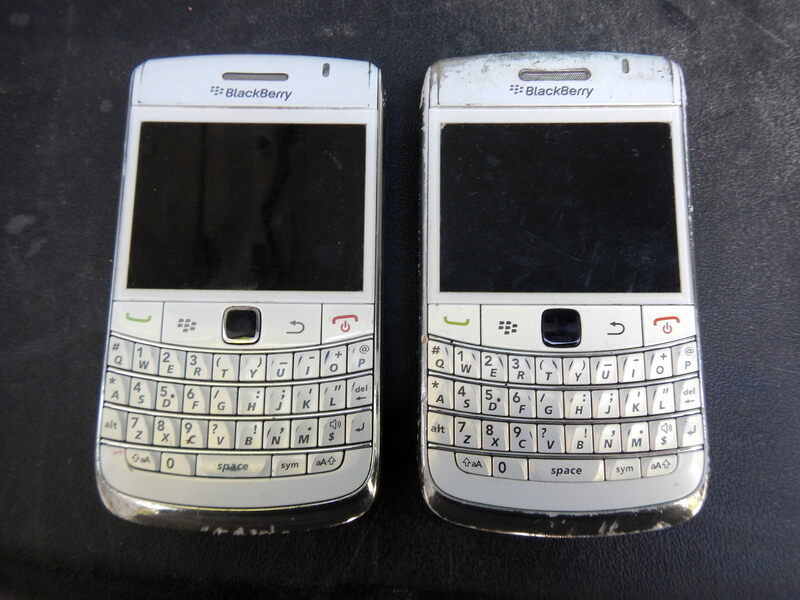 It’s the exact same model as the one I’ve been using for years but it’s actually in better cosmetic condition (on the left in the picture). I have a couple of backup phones already so I’ll likely put this one up on eBay – used models seem to sell for around 40$. 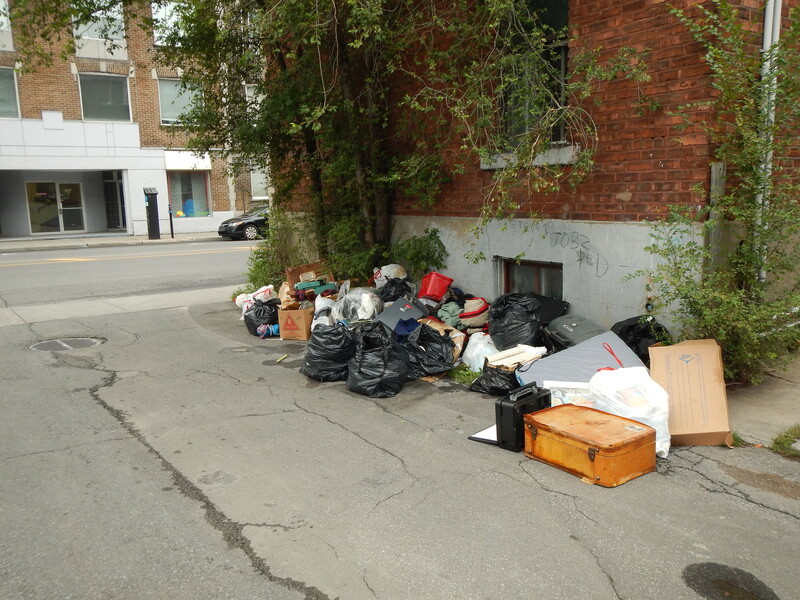 I came across this pile while checking out a heavy garbage day in Ville St Laurent. Inside the bags I found a collection of old Greek books and magazines, many of which came from different Ahepa conventions in the 50s and 60s. These conventions must have been pretty noteworthy – the inside of one of the magazines features statements by Eisenhower, Diefenbaker, Jean Lesage, and Jean Drapeau, among others. 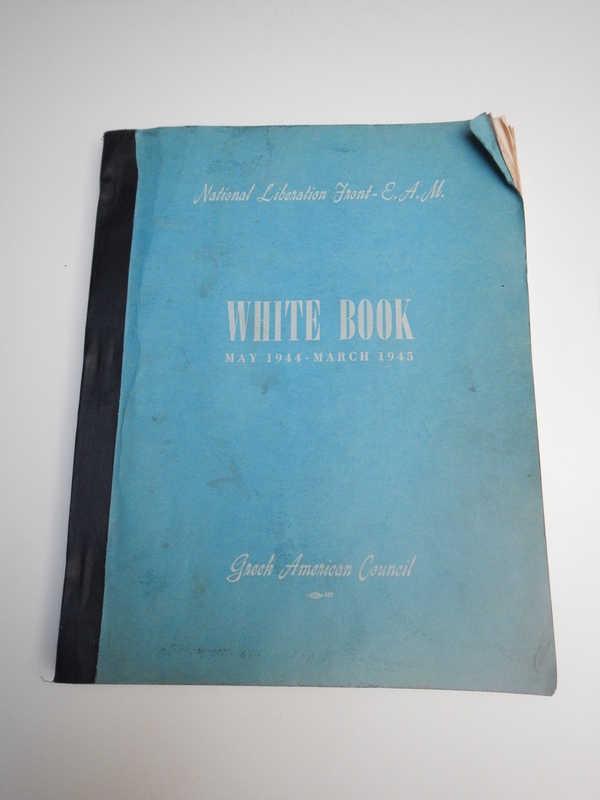 The most valuable piece might be the “White Book” pictured above. It was published during WWII by the EAM, or National Liberation Front, which was one of the primary players in the Greek resistance of the Axis and eventually the Greek Civil War. I found three different copies on Amazon ranging from 105$ to 199$ – I listed mine on eBay for 100 USD + free shipping in hopes that it will sell relatively quickly. I’ve also been keeping an eye on a spot in the Plateau that provided some neat vintage stuff in past weeks. On one garbage day there was a single bag out front that contained mostly old rubbish. Since I knew the spot, however, I dug around a bit and pulled these two beautiful old mugs out from the debris. 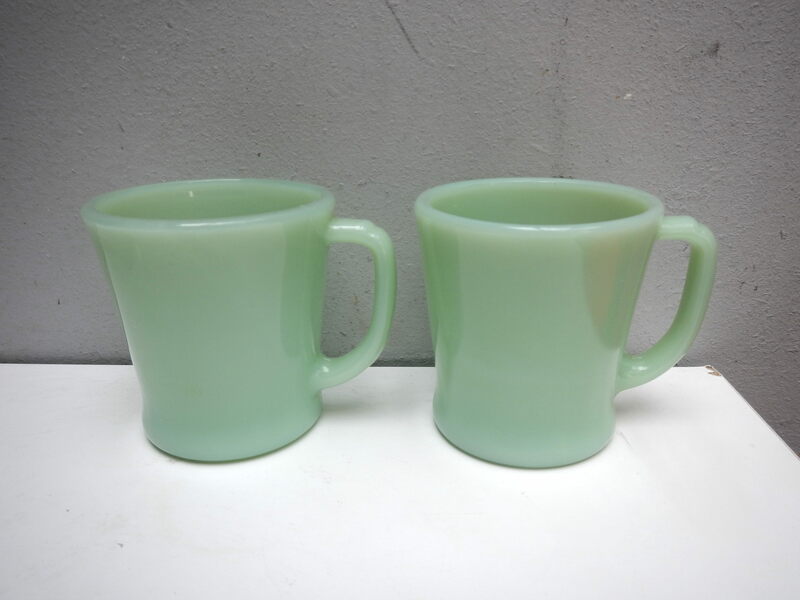 They’re Anchor Hocking “Fire King” Jadeite mugs and they’re quite collectible. A single, very similar mug sold for around 30$ + shipping. I love these mugs though and am very tempted to keep them myself. I went back the next two garbage days and found nothing. For whatever reason I found that a bit odd and decided to see if there was anything in the alley behind the building. When I turned the corner I saw a giant dumpster loaded with stuff, much of which was made inaccessible by large construction materials. 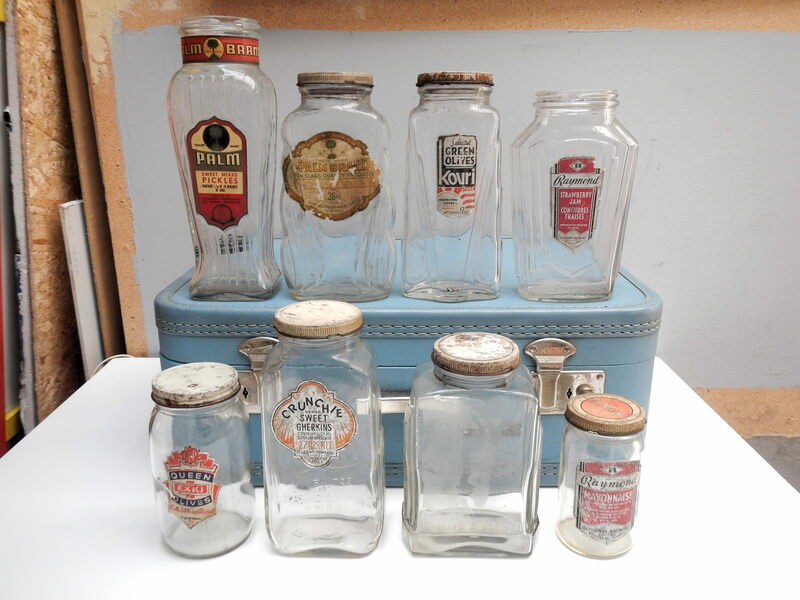 I was able to dig around a bit regardless and saved a collection of 1930s-1940s era food jars. Many feature cool labels from long defunct Montreal-based companies and have cool art deco inspired designs. I doubt they’re worth much but I think they’re pretty great regardless. -Vintage bottle of Chanel #5: to a reader for 20$. She wanted it more for the bottle than for the scent, which has apparently gone off over the years. Found a few weeks ago in Cote-des-Neiges. -1930s Aerolux neon light bulb: on Ebay for 67$. This sold just a day after it was listed, making me wonder if I should have asked for a bit more. A quick sale is always good though, and I know that some collectors check for new listings very often. This bulb was really beautiful and if I were rich I would have kept it. Found in Snowdon back in May. -Collection of Montreal-related ephemera: to an archivist for 50$. This included a few of the old newspapers from a few posts ago, the Ahepa stuff from this post, but also other random papers that somehow relate to the history of Montreal. A 1940s-era envelope sent from the Montreal Gazette (with a nice old sticker at front) is one example of such a paper. At some point these things will be scanned and made available for anyone to see. -Two yard sales: 208.50$ on Thursday and 147.50$ on Sunday (356$ total). These were a lot of fun and made up for recently-slow eBay sales. I made a lot of my money a dollar or two at a time but also made a few bigger sales, the largest of which was the collection of tobacco pipes and accessories that was sold off to a few different buyers for just over 40$ (not including a few pieces that I had sold previously). A nice old guy in Mount Royal gave me that box way back in April and I’m glad to see it go. Total: 493$, 3046$ since May 18. A pretty good couple of weeks thanks to the sales. I am located in Dorval, and would meet somewhere to pick up. Well-written post. I love the little tidbits of related information you provide. I hope you find your camera soon. As you say, the learning curve on a new one can be onerous. Interesting finds! I’m glad to see you’ve had a couple of yard sales and made a few more sales this month. My parents used to have a number of those Anchor Hocking “Fire King” Jadeite mugs, but I guess they’ve gone the way of the dinosaur. I really like that silver ring (looks like amber). What size is it? My name is Suzanne and I think I lost that pendant. Just kidding. I do like it though. What are your plans for it? Haha. It actually has already been sold to another reader. It was pretty popular! I live in Cote Des Neiges and I noticed this week that even city libraries often throw out discontinued library books in recycling bins rather than give them away.I was coming home from the groceries and I saw a recycling truck parked on the side of the road with its back open.The driver was not even in the truck.Inside I saw the truck full of loose papers,juice boxes and library books.Since the back was open,I reached in and pulled out three great books from the recycling truck before quietly walking away.I noticed after bringing them home that all three rescued books had library stamps on them;two were from the Jewish Public Library and one was from the Ville De Montreal library network.I am cynical about donating books to charities or libraries.I just keep them for myself,my nieces and nephews,my parents,my siblings and my friends. WOW beautifull lucky finds 🙂 I love your blog.